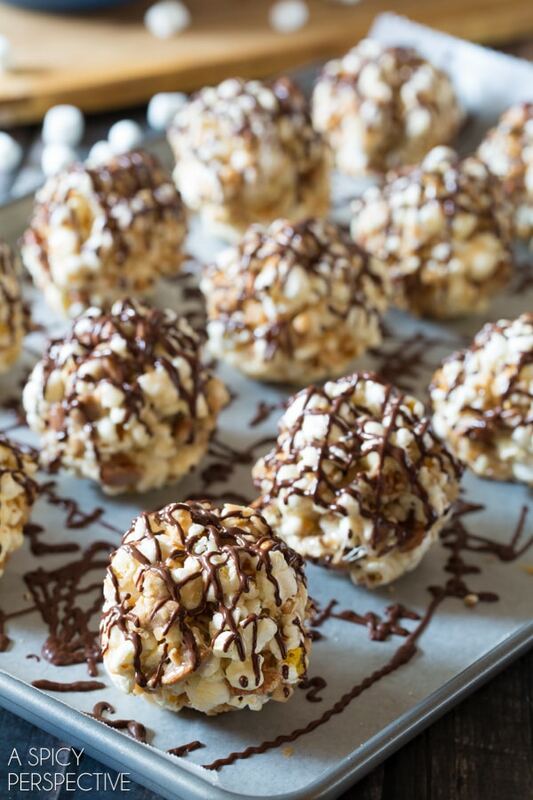 Decadent Toffee Pecan Popcorn Balls with Chocolate Drizzle. 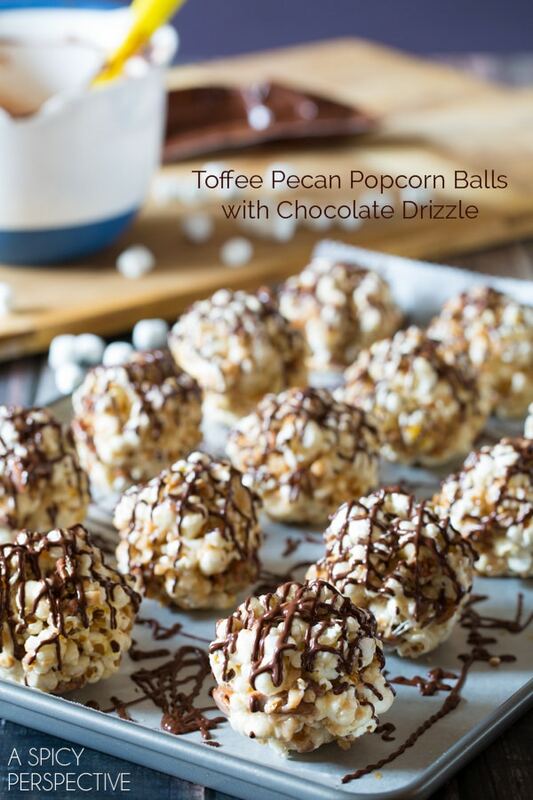 Rich, nutty, and drizzled in dark chocolate, these popcorn balls will be a hit at all your holiday gatherings! 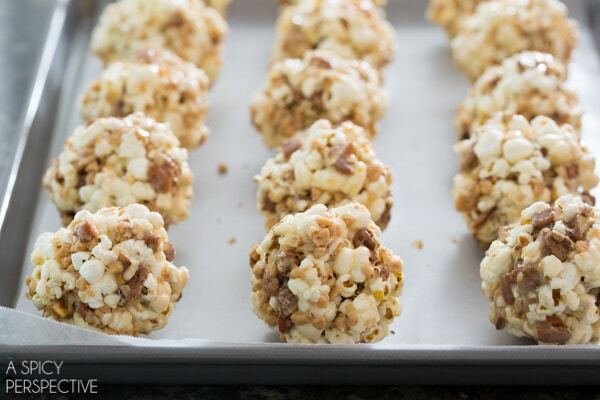 I never knew how much I loved popcorn balls until I started experimenting with this recipe. You see, most of the popcorn balls I’ve eaten over the years have either been too moist, giving the popcorn a somewhat soggy texture, or too “candied” with a tough outer coating that is hard to sink your teeth into. To me, any treat worth eating shouldn’t be a chore to chew. So this season I thought I would create popcorn balls that I wanted to eat. Balls that wouldn’t get passed over on the holiday dessert table. Today’s Toffee Pecan Popcorn Balls with Chocolate Drizzle are the result of a 4-part testing period, in which the kids and I made various small batches of popcorn balls until we came up with just the right flavor and texture. We determined in our testing that even with the right candy texture, popcorn balls tend to be flat in flavor. Meaning lots of half-eaten balls in the trashcan. So we ramped up the flavor of these Toffee Pecan Popcorn Balls with Chocolate Drizzle, by what you see in the name: toasted pecans, crunchy toffee bits, and chocolate. Then I added a touch of cinnamon for good measure. The candy mixture is made out of butter, marshmallows and sugar. 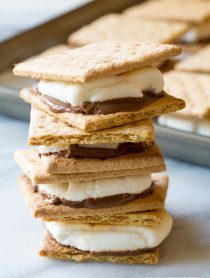 The sugar dissolves into the molten marshmallows creating a candy coating that is glossy and slightly firm, but soft enough to bite into without breaking your teeth. We think we stumbled upon something special. Toffee Pecan Popcorn Balls with Chocolate Drizzle make marvelous Halloween party favors, and will be the bell of the ball at your annual holiday cookie exchange this year. 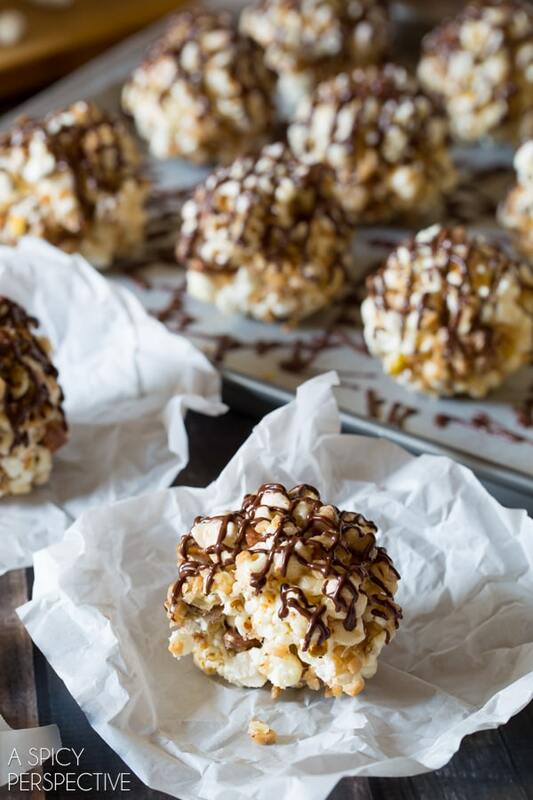 The best part about these Toffee Pecan Popcorn Balls with Chocolate Drizzle is that they are quick to make and quick to clean up. This is an edible project the whole family will enjoy! Preheat the oven to 350 degrees F. Spread the pecan pieces out on a rimmed baking sheet. Bake for 5-8 minutes to toast. Then set aside to cool. 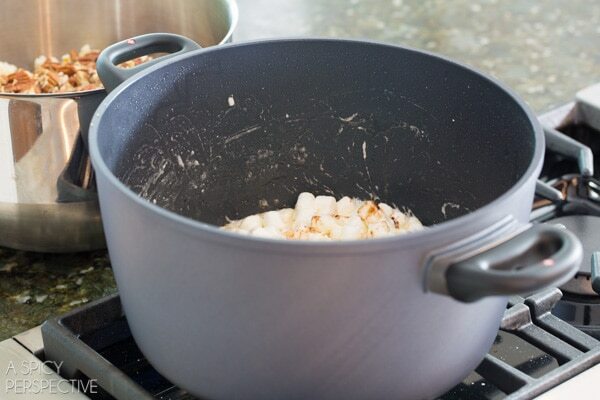 Wipe the pot out with a paper towel, then place back over medium heat. Add the butter, sugar, marshmallows, salt and cinnamon. Stir continuously until the marshmallows are completely melted and the sugar crystals have dissolved. Turn the heat off and pour the popcorn and pecans into the pot over the marshmallow mixture. 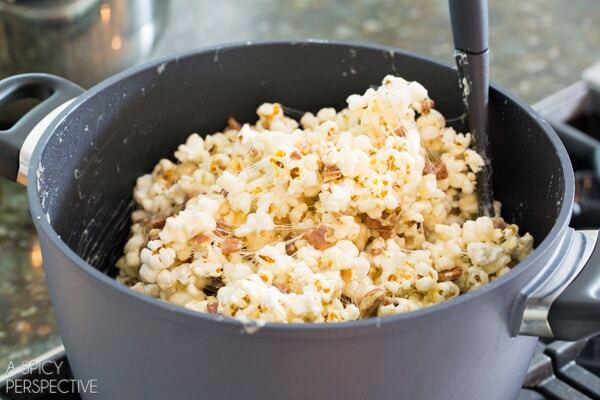 Using a large wooden spoon, mix the popcorn until completely coated. Make sure there is not a pool of marshmallow down at the bottom of the pot. After it is well mixed (and has cooled a little) sprinkle in the toffee bits. Stir to combine. Melt the chocolate chips over a double-boiler or in the microwave. If using the microwave, heat on medium in 30 second increments, stirring in between, until smooth. Then pour the melted chocolate into a zip bag and snip off the corner. 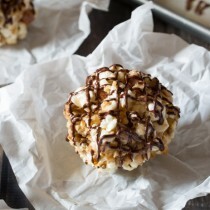 Use the bag to drizzle the chocolate over the tops of the popcorn balls. 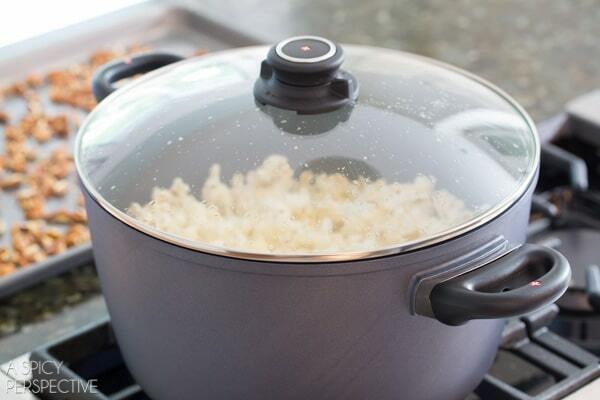 Allow the popcorn balls to rest until the chocolate is firm. Then wrap individually for edible gifts! 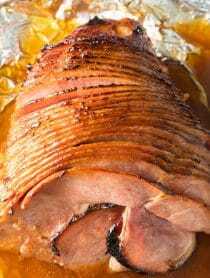 I’ve definitely made this recipe more than once – so yummy!! Would it work to freeze them? Or would the popcorn get soggy? 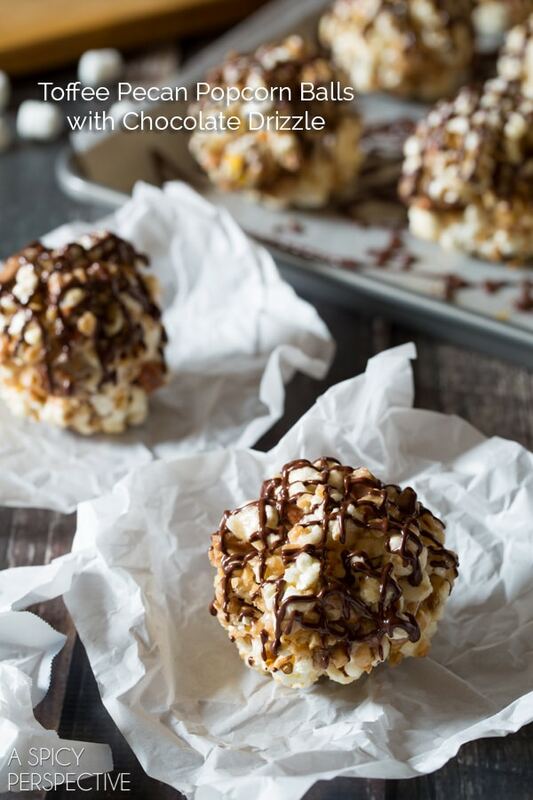 I don’t know how it’s possible I’ve never had a popcorn ball when my love for popcorn reigns supreme but that has to be rectified NOW…with these amazing looking popcorn balls! My parents used to put a popcorn ball in our stocking every Christmas…and every year those popcorn balls never gotten eaten. If they had been as gorgeous and filled with good stuff like yours, I’m sure they would have disappeared better. Love all the fun stuff you added to these…and the chocolate drizzle totally makes me want to grab like 6! You’re feeding my popcorn addiction! Must pin for later. These are just too cute, Sommer! Such a yummy snack!! Perfect for pre halloween trick or treating! I would definitely not pass these by on the dessert table! Love that chocolate drizzle and they’re the perfect size! Eeeeek!! I love these! I could never turn down anything with toffee and chocolate! These look great!! They’re the perfect size, too! 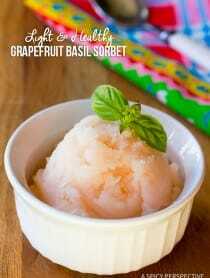 This is such a fun snack! Lovely idea!